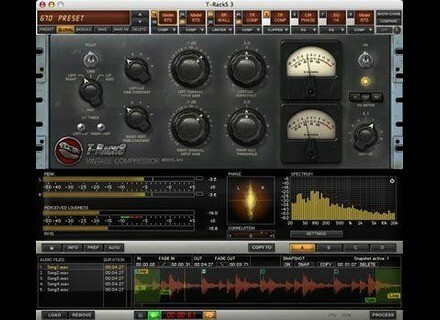 T-RackS 3 Beyond Mastering, Other software dynamics processor from IK Multimedia in the T-Racks series. 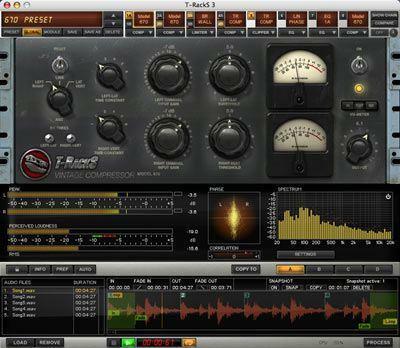 IK Multimedia's mixing and mastering suite has now evolved into the next generation - T-RackS 3. The original T-RackS software was the first analog-modeled mastering solution, and now T-RackS 3 has 9 analog-modeled and digital Dynamics/EQ processors. 9 processors in the Deluxe version, comprised of 3 new analog and vintage emulations (including models based* on the Fairchild 670 and the Pultec EQP-1A), 2 new digital processors as well as the 4 classic, award-winning T-RackS processors. 4 Processors in Standard Version. T-RackS 3 is now available from IK's online store and international network of authorized dealers and resellers for only €379.99/$499.99 for the Deluxe version, and just €229.99/$299.99 for a reduced price crossgrade version (available to all registered users of any IK product). Also available is T-RackS 3 Standard, which includes the 4 Classic T-RackS processors, at a price of €149.99/$199.99. All prices exclude taxes. For more information on T-RackS 3, video and audio demos and more click here. Audio Impressions DVZ Strings 2.0 Audio Impressions has announced the release of version 2.0 of DVZ Strings - their new high-resolution virtual-instrument strings library that comes with their patented Divisi technology which, AI states, eliminates the compromises of sampled libraries by delivering real-world, real-time, section balances.